Jimmy Wambua, a social justice worker and young entrepreneur in Nairobi, Kenya, saw a problem. 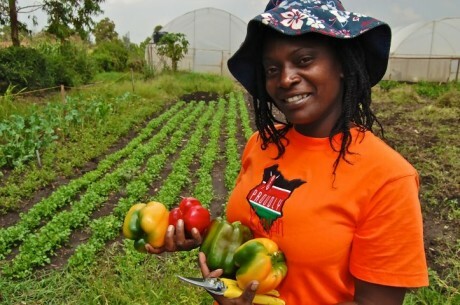 In a country where smallholder farmers grow the food that feeds the Kenyan people, crop yields were not reaching their full potential and growers were not getting a fair price. Decisions about what crops to plant and when were made on speculation and instinct, and farmers sold their crops based on prices offered by middlemen and traders. A solution seemed evident: increase access and sharing of information that already exists and is public, but is not in-use by the farmers. Jimmy joined the M-Farm organization that set up a text-message based mobile phone application for farmers to gain a better price by accessing market price for their crops- rather than relying on the word of the buyer- and provide a platform for farmers to sell their goods online. USAID contributed to the work of M-Farm- not through a grant or loan or other financial capital- but with information capital. With the release of an open data set from the Famine Early Warning System (FEWSNet) M-Farm now has access to ten years of historic data about market prices of crops, which show trends in crop price fluctuation, and enables better decision making on which crops to plant to yield the highest income. M-Farm’s story was just one of dozens that took the stage April 29 & 30 at the G-8 International Open Agriculture Data Conference and showcased innovative organizations that use open data to support global food security. Dr. Howard-Yana Shapiro of Mars Global shared progress on mapping the genomes of over 100 crops that are vital to food security, but are overlooked because they are not commercially viable. Palantir Technologies and Grameen Foundation displayed their open data app that they developed at USAID’s Hack for Hunger,which uses community knowledge worker-collected data and Palantir analytics to build a crop-specific food security early warning system for farmers in Uganda. 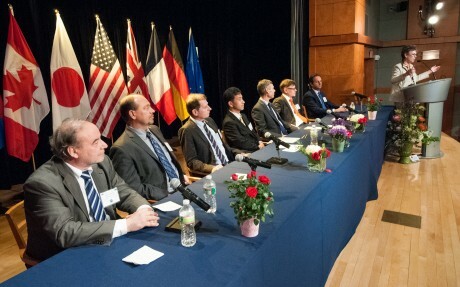 The G-8 Heads of Delegation Valery Khromchenkov (Russia), Robert Turnock (Canada), Hideaki Chotoku (Japan), Tim Wheeler (United Kingdom), Guillou Marion (France), Martin Koehler (Germany), and Giulio Menato (European Union) listen to Agriculture Under Secretary Research, Education and Economics (REE) Dr. Catherine Woteki (U.S.) announce the action plans developed at the G-8 International Conference on Open Data for Agriculture 2013. Photo Credit: USDA photo by Bob Nichols. USAID has been consistently demonstrating its role as a leader in increasing open data. Multiple G-8 conference speakers joined because of products they had made as a result of the December 2012 Development DataJam that USAID’s Innovation & Development Alliances (IDEA) office co-hosted with the White House Office of Science & Technology Policy. At the DataJam, USAID leadership joined with other issue experts, innovators, data scientists, and entrepreneurs to commit to developing prototypes that use open data to improve international. Continuing the support of these and other data innovators and social entrepreneurs, last week USAID launched www.usaid.gov/developer with new datasets and tools that had previously not been available to the public, including some we support through Feed the Future the U.S. Government’s global hunger and food security initiative. Each of these datasets are useful on their own, and when compared and applied with other datasets from USAID and other organizations, they have the growing potential to dramatically increase the impact and efficiency of international assistance. In an increasingly networked and tech-savvy world, open data has the potential for more people to use information for social good, and USAID and global development goals directly benefit from increasing access to information.Like any technological tool, open data is useless without the people applying and engaging with it. Only through active and consistent participation can we ensure that information is timely, useful, and used. We can expect that these changes will come. Let’s get that information online and useable. Let’s get data open. Food security data is just the beginning. For more information on USAID’s open data work, visit www.usaid.gov/developer or email OpenAgData@usaid.gov. Katherine Townsend serves as Special Assistant for Engagement in USAID’s office of Innovation & Development Alliances. Follow her on Twitter @DiploKat.